The original plan was to go to Chamonix for some skiing and perhaps some alpine climbing. I had arranged to hook up with French photographer Alexandre Buisse who used to live here in Copenhagen, from where have had several good trips for ice and rock climbing in Sweden. Alex had recently moved to Chamonix to start his photo business. It would be great to share some adventures with him again, but Alex had been having an epic with an unplanned bivouac on Les Courtes. This had given him some frostbitten toes (luckily not to serious) so he was out of the game. 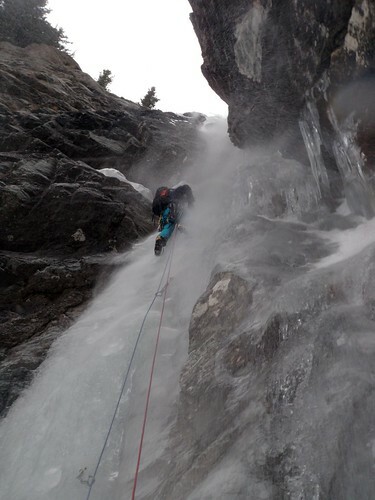 I had almost given up on any trips when I got an offer from my old climbing friends to join them for a long weekend ice climbing in Cogne, Italy. After a long drive Wednesday night we arrived in the picturesque town of Cogne on Thursday. Ice conditions where brilliant and the following three days we did all kind of routes. One of the highlights of the tour was the Lillaz Gully, that I did with Anders HP. The Liliaz Gully is a fun 200 meter long gully that can best be described as an Italian version of the classic Scotch ‘Point Five Gully’ with fun ice and mixed climbing. Cogne is a fantastic place to climb ice in extremely pleasant surroundings with the mountain of Grand Paradiso close by. As the gallery shows I had a marvelous three days with good friends, good climbing and good Italian food!